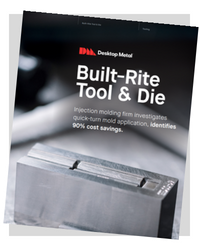 Built-Rite Tool & Die is a mold-making and design firm in Massachusetts with expertise in precision mold manufacturing. They specialize in the production of molds for plastic injection molding. These molds have complex designs, requiring extensive planning and precise execution. The Studio System allows Built-Rite to realize the benefits of additive manufacturing. By reducing material usage and printing with closed-cell infill, Built-Rite can produce lightweight parts within the mold assembly without impacting wear resistance required for tooling applications. With the help of Desktop Metal, Built-Rite was able to reduce cost by 90%, reduce time by 30% and reduce part weight by 41%. To learn how Desktop Metal was able to achieve these results, read the full case study.